For more than twenty years, Thailand has been receiving migration from the countries within the Great Mekong Subregions (GMS), predominantly from Laos PDR, Myanmar and Cambodian. Owing to the labour shortage within the country, the migrants, from the neighbouring countries, have been fuelling human capital to the labour-intensive industries of Thailand. The employers hire predominantly the low-skilled migrants for the industries such as fishing, agriculture, construction and others. However, historically, it is acknowledged that industrialisation has been a primary cause of internal and international migration. During industrialisation epoch, employment opportunities generated within the industrial centres, causing mass migration of people. Owing to which rapid population growth was documented within the industrial workers. To accommodate these workers, the employers of the industries developed industrial towns, which were termed as company housing/towns. These housing developments had several basic infrastructural inefficiencies. They lacked architectural aesthetics and planning. In Thailand, similar to company housing, the employers are providing housing to the migrant workers. However, contradicting to this consideration, the employers are exploitative and abusive with regards to migrants. Further, the futile governance and approaches, towards migration, in Thailand, has caused a state of isolation and exclusion for the migrant workers. The non-similar cultural backgrounds of the migrant workers have caused social and cultural deprivation. Although, there are arguments, in support and against, the migration and development nexus, it is acknowledged that migration has caused an immense demographic shift, affecting the socio-economic and cultural structures of a place. Especially, in the recent times perception towards the international migration has suffered through disputing ideologies. Growing ethnic diversity, and the governance of international migration, owing to the persistent in-migration in the receiving societies, are conceived as the prominent challenges of the current state of international affairs. Preponderantly, migrants come from diverse cultural origin or ‘phenotype’, which is considered to cause insecurities among the receiving communities and governments. Hence, the growing uncertainties have placed the migrant groups on the forefront of exclusion – social, political, economic and cultural – with respect to the context. These identified challenges, in the discourse of migration, are considered being well embedded in the Thai context. This thesis tries to study two factors of Thai in-migration. Preponderantly, the thesis tries to delve into the housing provided by the employers, to the low-skilled international migrants, and their social exclusion. As mentioned earlier, referring to the industrialisation era, the Thailand government considered the employers to be responsible for the migrants housing and their other basic necessities. However, this research tries to explain that the housing provided by the employers, to their migrant workers, is further consolidating social exclusion of the migrants from the Thai society. 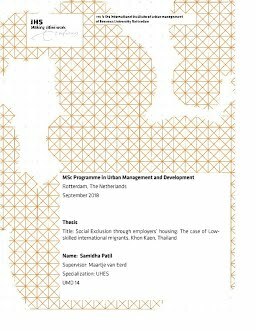 The research identifies planning and management, of these housing developments, as one of the factors that has been a fundamental cause of low-skilled migrants’ exclusion from the Thai society, at the industry level. In this thesis, a comprehensive understanding is developed on these two factors and their sub-factors. The research also considers that with respect to the international migration, the government policies are the essential factors, causing migrants’ exclusion. Likewise, along with the exclusionary policies, it is identified the employers’ housing as one of the factors which constricts integration between the migrants and Thai society. Through, this research it is found out that, the stringent regulatory system that is developed, to manage the low-skilled migrants within the industrial parameters, is one of the fundamental causes of exclusion, at the industrial level. The following thesis illustrate this finding in depth.